Warning! What you are going to read is not a traditional party report. My goal is to tell you how an Amstrad CPC coder, using only the real hardware to write z80 assembly code, and who disagrees with the general "artistic turn" of the recent demomaking, felt the Revision 2012. Consider this report as an "oldskooler point of view", and by consequence, be ready and keep childrens away. After a short night on the cold and hard tiled floor of Toms' flat, Beb and I went to Saarbrücken by car. Only one hour and a half to reach the party place. Three hours after the doors opening, there were already some hundreds of people, so it was hard to get a place in front of the screen! We finally found a cozy place in a corner of the hall, who can host 10 smelly and slightly alcoholics CPC sceners, our 5 CPC screens, several packets of chips, and short-drink. Exin was already there, but quite far from us. Ten minutes after our arrival, my phone rang: "Hello, it’sss Voxxfrrreax! I just enterred in the halrlr of the parrrty, where arrre'u?". Voxfreax just arrived from Athen by plane. The whole Benediction team will be complete at 8pm, when Eliot and Krusty will be finally there, after a delay of their train. Meanwhile, the southern group landed: Offset, Zik, and Grim. 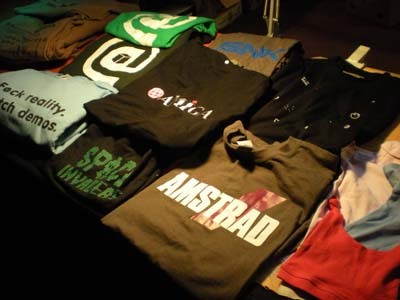 Guys from www.demoscene.fr were close behind us, and we said hello to Rouquemoute, Made, Rez and others. After the opening ceremony, the Revision staff chose to show us a Hungarian documentary about the demoscene named Moleman 2: The Art of the Algorithms. The nice surprise was to see that it wasn't PC-centered, and they devoted a large part of it to the oldskool scene. But as usual, oldskool was reduced to Commodore 64. It's true that C64 is the biggest oldskool scene, especially in north and east Europe, but what about ZX Spectrum, Amstrad CPC or Atari ST? I must confess that I'm a little bit annoyed by the hegemony of the C64 in parties. It was also nice to see some images from Main #5. 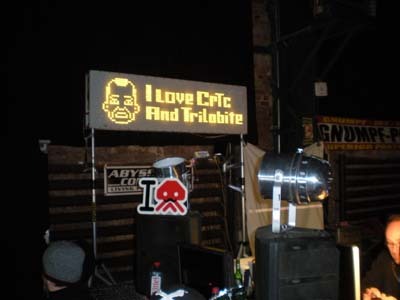 And finally I must attract attention of the CPC scene to an Hungarian party named Arok party: 8 bits oriented, existing since a long time (14th edition! ), same distance than Forever in Slovakia. It would be nice if CPC was represented in this party next year! The next awaited moment was the announcement of the Scene.org Awards selection in every categories. Each CPC scener was of course impatient to see in which categories Batman Forever was selected. In much than expected I think: best demo on an oldskool platform, best graphics, best technical achievement, breakthough performance, and public choice. The final result will be given at Assembly Summer, on the 4th of august. You can see the complete selection here. The evening ended with a LOUD live act by Knoeki. Music was really too loud to stay inside, and weather too cold to go outside! Forunately, the classical bonfire allowed us to warm us with a slight chiptune ambiance as a background. Time to sleep. A lot of people were sleeping behind the bigscreen (and the bigspeakers), but at 4am, it was already full. So I decided to sleep under my table, close to my dear Beb. Wake Up! Yes, 10am is the time to wake up, and this evening, Benediction team will present their big project, Wake Up! 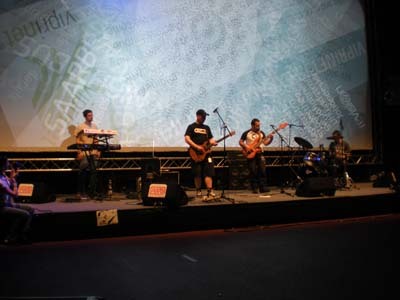 It's the most awaited event of the day for the CPC sceners, with Reed's music in the Executable Music Oldskool at 6pm. But before that, what about taking a coffee? 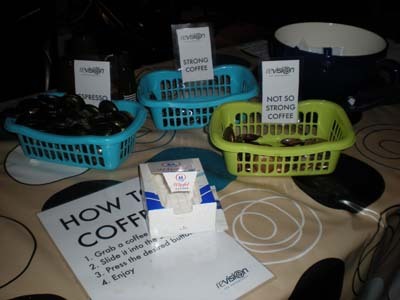 ("I prefer a beer", said Grimmy) This year, the Revision team provided free coffee for everybody! A nice and useful idea to stay lucid during 3 days. Free coffee to wake up the scene! As the most involved guys in the creation of the "30 years old Megademo" were there, we started to speak about the project's progress. Grim's demosystem seems very promising, Krusty already wrote the scenario of the intro, and Beb and I spoke about the last details of our menu and our first part. After a quite agitated discussion, Futurs' finally confirmed their participation. It was nice to see that the project is growing, and that everyone seems very enthusiast. A party is the perfect place to have public discussion about that, so, just wait for the Reset party #8 for the next focus! No CPC entry in the Oldskool Graphics competition this year. But, as a substitute, Beb submitted some banners to the LULI website. You just had to draw some pixels in a small area, and your banner was shown to everybody on the lightspot screen in a corner of the hall. For some hours, we saw messages related to Push'n'Pop, Pacman Forever, Submix, Reset party, and Trilobites. Check the original banners here. In the afternoon, Toms arrived when we were speaking of our next Vanity project outdoor, and Benediction, two tables away, were doing the same. But?! 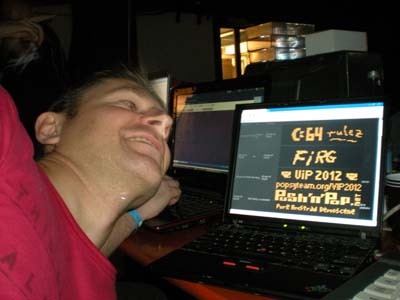 It's already 6pm, time to listen to the Oldschool Music competition! I don't remember all the entries, but of course I took more attention on Reed's music, named Hyperdragon. Nice tune, full of hard sounds, remember me some Ultrasyd's tunes. Unfortunately, we failed to meet Reed during the party! Before the compos in the evening, there was a great event: Romeo Knight's live act! Everybody knows this Amiga legend. I enjoyed the show near the scene with Toms and my earplugs (avalaible for free at the info desk). Nice to hear some guitars in this temple of electronic music. Time to lunch! We had to eat quickly because we wanted to see the 3 compos of this evening: Amiga 64k, PC 4k and Oldskool Demo. 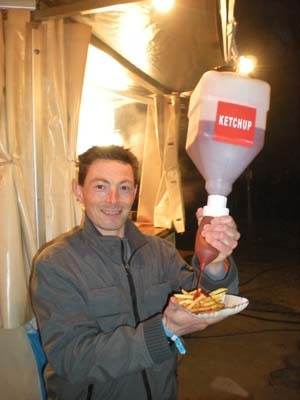 This year, the Revision staff improved a little the food stands outside. There is now a snack and a pizza stand. Nothing vegan there except fries: I did well to bring my own food. Other discussions on other subjects (cucumbers? eggplants?). At that time the compo show started. I must confess right away that I was very disappointed by what I saw. Each time the same pattern: 1000 times seen effect and a big techno beat to compensate the lack of novelty. Seeing dots, flat 3d cube or fake raytracing on an Amiga AGA was really disappointing. Maybe the PC 4k will be better? I must say: no. Just a special mention for Hartverdrahtet / Akronyme Analogiker, a fractal trip in the same spirit as Cdak / Orange, with an ambient music. First widely deserved place! And now, the Oldskool compo. Boogietown / Ghostown&RNO on Amiga ECS was the best challenger for Wake Up! As usual, Slayer (graphics) and Jazzcat (music) did a very nice job, but I was expecting a little bit more on the code side (Britelite). For example, these black buildings are better in Batman Forever on an Amstrad CPC! But still an enjoyable demo. I would like to speak a little bit longer about Wake Up! / Benediction, because it's a CPC prod! The demo is the result of one year and a half of work by Eliot and Krusty (code), Voxfreax and Exin (graphics), and McKlain and DMA-SC (musics). 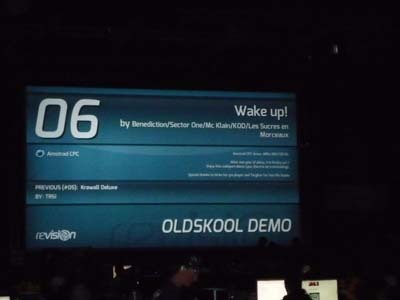 It was a really great surprise to see it on the bigscreen, because Benediction didn't announce it before the party! The result is really successful, and we feel that a new solid group is entering in the demo competition on CPC. On the code side, Eliot and Krusty chose to put a lot of effects in 4'30 to give some dynamics to their demo, so the show is never boring. Some effects are well thought and designed, like the 3 interlaced rotozoomers. This demo also demonstrates Voxfreax's talent: I really appreciate the colors, few black backgrounds, original logos. To my mind, you are the most interesting graphician of the moment with Beb! The music confirms also the great abilities of McKlain (your music for the Reset #0 was already very nice!). Melodic song, very "oldskool", exactly what we need! Also a mention to Exin for his final graph, the commercial "boobings" aspect of Benediction! And finally, I like the endpart messages, harsh, in the real spirit of demomaking. All CPC sceners present were enjoying this show. I wanted to say "almost" all CPC sceners. 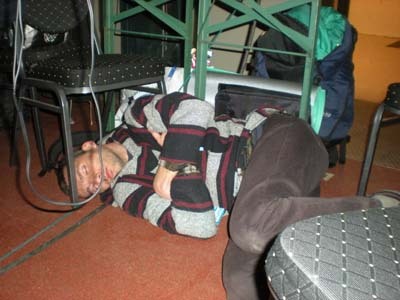 During the show, Grimmy tried an impressive kind of Guru Meditation on, then under, his table. Then, he can take a look at the live act here, as if he was present! After this show, everybody was quite excited and started to speak about Wake Up! with Benediction members, or worked on his CPC. Offset and Zik left us for their hostel. A luxurious room with Jacuzzi, rented with the money of Quasar CPC and Soundplayer+. Eliot noticed that, and decided to triple the price of CPC parts when he will be back at home. After a night sleeping, it was time to go to the shower. As the two last years, everything was clean. Perfect to start this last big day. This evening, another CPC demo will be shown, Benediction's 4k intro. A lot of other compos too today. At this moment, Toms, as he was taking some stuff in his car met two journalists from an Alsatian newspaper called DNA (Dernières Nouvelles d’Alsace). They were interested in writing an article about some Alsatian people who take part to this party. And, amusing coincidence, they are old CPC sceners involved in the demoscene in the mid-eigties! One of them was Arrakis (a fashion handle as there were two Arrakis on CPC! ), writer in Croconews and creator of "L'ami de l’Amstradien", an old papermag. Then, we spoke about this old time and the current CPC scene. You can read their article here. After the video report of TV-Saar last year, CPC seems to attract journalists a lot! We had to eat quickly again to go to Krusty's seminar at 2pm. Some seminars are one hour long, but Krusty's one is in the "4k seminar" category, it means: 10 minutes long. The great surprise was to see that the room was full of people. Sometimes, people left the room between two seminars, but it was still full during Krusty's talk. In front of 80 persons, he presented, with a perfect english accent, an overview of the CPC on the technical and historical point of view. The first fallout of this talk is the participation of Bonefish, a Croatian coder, to the 30 years old Megademo! You can see Krusty's seminar here (start at 32'). After the seminar, I think that Eliot, Krusty and Toms met a guy and his CPC running DemoIzArt. The CPC crew also met another scener named Doz, who is working on an hardware emulation of the CPC. He brought his card with him, and I heard that it was an impressive work. Unfortunately, I missed that. What about listening to some music? Yes, it's the SIDrip Alliance, followed by a live act by Hoffman. So, my plan was clear: listen to the first group and their C64 metal covers, and go far and fast just before the second set. SIDrip Alliance is a kind of Press Play on Tape, but choosing a more metal way to play some c64 classics. Very enjoyable. The set ended, applause! I am not the only CPC scener who hate techno music, big beat, loud bass and repetitive sample. Then a lot of us went outdoors to eat and speak around the bonefire where we met Wullon and other French guys from Ctrl-Alt-Test. Nice discussions! Only Zik stayed in the hall, dancing like crazy in front of the speakers during DJ Hoffman's set. Except this little drawback - too much techno music and too loud -, I must give all my congratulations to the Revision staff. Everything was perfectly organized, clean showers and toilets, free coffee, respected timetable, etc. Just one problem: there were a lot of power outages at our table, something like 10 times in 2 days. Very painful when you are working on a CPC, without battery! And then arrived the last 4 competitions of the party. I would like to talk a little bit about them, even PC compos. Some old CPC users would say: what is the interest of speaking about PC demos in a CPC report? Because implementation of fractals, raymarching, physical engine and else is more interesting to think about than another scroller demo. It's the future of oldskool demos, from my point of view. - The Scene is Dead / Razor1911: a classical raymarching engine, but with an olsdchool touch (Dubmood music! 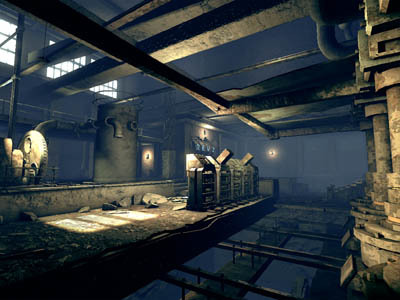 ), showing a great progress of Rez. 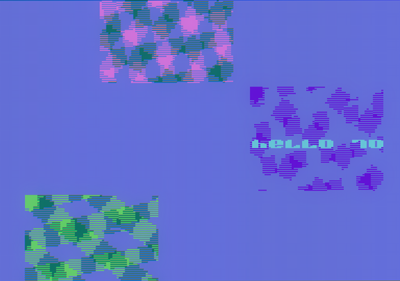 - f - Felix's Worshop / Ctrl-Alt-Test: I'm not fond of these cold visuals, but the direction is very nice and rare to find on 64k. Nice to hear another different music too! - Gaia Machina / Approximate: impressive visuals, and a different atmosphere. Nice surprise! And then started the Oldskool 4k intro competition. There were some interesting things, like Stella Lives / Tjoppen on Atari VCS, False Dimension / Pers' Wastaiset Produktiot on C64 and his landscape generator, Purple Eggs / BooZombies on Amiga ECS and his infinite fractal zoomer. As you can see, the interesting point was to confront different 4k on different machines. And of course, my attention stopped especially on Benediction’s CPC 4k named Stop that Nyan Cat! It’s the second Krusty's 4k, after Still the Bests! And maybe the 4th serious 4k on CPC. It's the first one who shows us not only one effect but several, as a mini-demo. Voxfreax did a great job with colors, as usual, and we can see, in a window, a fire effect, plasma, bump and tunnel effect. Another great surprise with Wake Up! I would like to say a word about Benediction, a kind of deserved bootlicking. The whole group was present at the party, Eliot and Krusty (Normandy / France), Voxfreax (Athen / Greece) and Exin (Hannover / Germany). Something very usual for the demoscene in general, but exceptional for the CPC scene. They presented Wake Up!, Stop that Nyan cat!, and Krusty talked in a seminar. We can also remember that last year, they released Bloc Us!, Les Experts, and Still the Bests! Everybody can see that their 2012 productions are better than 2011's one. Finally, add that Eliot organizes the last CPC only meeting, the Reset party, provides some CPC parts to the whole world, and that Krusty launched the idea of a 30 years old Megademo. Total respect to you guys! Back to the party. My PC and Amiga demo compo review will be quick. The PC demo "competition" was composed of 18 entries, and I must say the truth, 18 uninteresting entries. Everybody already noticed that the trend of the whole society was consumerism, effortless, formatting, and else. Demomaking is more and more an illustration of these trends, and the consequence is that we often see formatted demos, no risk, a try to satisfy the public, get some applause, some thumbs up, and to be popular. Always the same "just for fun" or "we love you" poisoned mood. Demomaking is about battle, competition, breaking the limits. Without that, it's impossible to go ahead. Remember you the harsh messages from the old demos, or more recently in Batman Forever towards the CPC and C64 scenes. That's the spirit. Of course, no way for stupid fuckings or childish attacks. We have to meet each other to "have fun", but the demomaking philosophy must stay harsh, demanding and difficult. The PC demo competition winner was pc-06: rev.2 / Panda Cube: a smooth, formatted, professional demo. A good product for the crowd. Amiga "competition"? Only Kioea / MadWizards showed us something enjoyable. Nice visuals, probably efficient engine, but from my point of view, I don't understand why in 2012 there is not a When we ride on our enemies / Skarla killer, with a faster and thinner engine. And I do not even talk about a TBL killer. The last day is dedicated to the prizegiving. 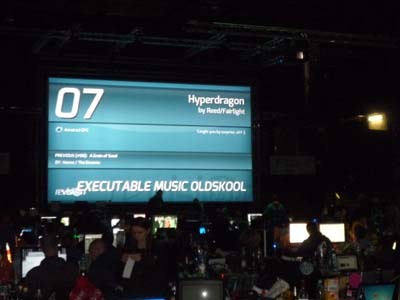 We were especially waiting for the results of the Executable Music Oldskool, Oldskool Demo and Oldskool 4k Intro. Reed took the first place with his music, and Benediction was two times third. I was expecting a little bit more for them, but it's quite fair finally due to the lack of popularity of the CPC. 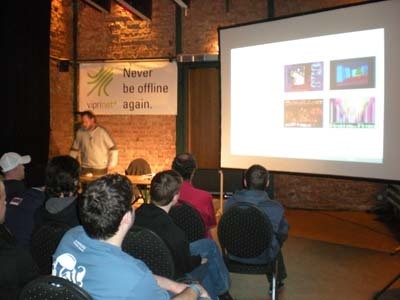 On the stage, Britelite finally got the first place of the Amiga Demo competition with Kioea. He took the micro to deliver a message to the scene: "Do better demos". I can't say better.